Lomas And Pigeon has a team of highly skilled craftsmen who are able to offer a wide range of antique furniture restoration services. 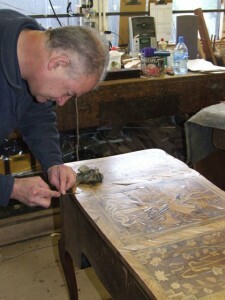 We are specialists in antique restoration and conservation of furniture and fine arts. This includes the restoration of chairs, tables, desks and cabinets.Whether the backs or legs of your dining room chair have broken or your table has been scratched or stained with ring marks, we can advise on the best way to restore/conserve your furniture. This image shows one of our craftsman at work making a replacement leather desk lining. We are also able to restore metals including silver, gold, copper, brass and pewter, make or supply replacement fittings and mounts for antique furniture. We have knowledge and experience with many different styles and periods of antique furniture. As full members of the British Antique Furniture Restorers Association (BAFRA) you can expect the highest level of expertise and skills from our team of craftsmen. We understand the history of antique furniture, and the sentimental value that it can have to people. All furniture requires good care if it is to last a long time. Antique furniture restoration needs expert advice and attention to help it endure and keep it in good condition. Lomas and Pigeon provides antique furniture restoration whether it be for a single heirloom or private collection. It is essential not to ‘over restore’ antiques. We can advise on the most appropriate antique restoration methods to be used without detracting from the piece. Contact us today to discuss how Lomas And Pigeon can help you with your antique furniture restoration requirements. As members of the Antiques are Green initiative, we believe antique furniture restorationis also environmentally friendly. Finely crafted antique furniture lasts longer than modern alternatives if it is looked after. This means it does not need to be replaced so often and has less impact on the environment. Please contact us on 01245 353708 or fill in the call back form on the right hand side and we will contact you by email.